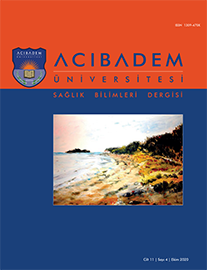 3Bakırköy Ruh Sinir Hastalıkları Eğitim ve Araştırma Hastanesi, Nöroloji Yoğun Bakım, Bakırköy, Türkiye DOI : 10.31067/0.2018.30 Objectives: The main reason why we have insufficient organ donation from cadavers in our country is the lack of focus on brain death (BD) by the clinicians working in the intensive care unit (ICU). The aim of this study was to analyze patients diagnosed with BD in a neurological ICU. Patients and Methods: We retrospectively analyzed twenty-three patients who had been diagnosed within the year by BD in the Neurological ICU of Bakirköy Research and Training Hospital for Psychiatry, Neurology and Neurosurgery. Results: The mean age was 62+14 and 56.3% were male. The admission diagnoses were ischemic infarction (52.2%), intracerebral hemorrhage (39.2%), sinus thrombosis (4.3%) and hypoxic encephalopathy (4.3%). The time interval between ICU admission and BD diagnosis was 27.5 hours. The signs leading to BD were brainstem areflexia, decreased Glasgow coma score, loss of spontaneous breath and polyuria which were noticed first by the neurologists in 10 subjects and by the intensive care specialists and anaesthesiologists in 13 subjects. BD decisions in 15 patients were given by apnea testing and neurologic examination. Further tests were conducted in five patients because of inability to perform apnea tests whereas neurologists ordered additional tests in three patients. The rates of hypotension, diabetes insipidus and hypothermia were 95.5%, 78% and 61.9%, respectively, and they were managed properly. Organ donation rate was 13%.